A programme of women's prison closures should begin in an attempt to reduce re-offending, a lobby group has said. There are about 4,600 females in prison in England and Wales. The government says it is spending more than £9m on community initiatives for women as an alternative to prison. This is partly prompted by the pressure of a prison population which has risen by 85% since 1993, to 78,739. 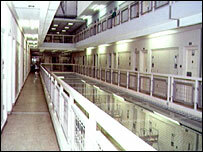 A review of women prisoners, led by Baroness Corston, is under way following the death of six inmates at Styal Prison, near Wilmslow, Cheshire, in the 12 months leading up to August 2003. League director Frances Crook said she hoped this would provide the impetus for the government to reduce the women's prison population, so only the very few who posed a danger to the public remained in custody. She told BBC Radio 4's Today programme that community treatments would reduce reoffending rates drastically and save the lives of many women who would otherwise kill themselves. She said: "If we had a planned programme of closures over the next five years, we could get women to make amends for the wrongs they've done, it would be safer for the public and there would be fewer victims in the long run." Women responded differently to incarceration because they were primary carers and they suffered greater drug addiction and mental health problems than men, she argued. And many women were in custody while on remand so had not been convicted of a crime. But Anastasia de Waal, head of family and education at the think-tank Civitas, disagreed that policy should be based on gender. She told the same programme: "The problem is between sentencing and the crime and that is what we should look at. This is about malfunctions which apply to men as well as women." And Lyn Costello, co-founder of Mothers Against Murder and Aggression, said it was important that male and female violent offenders were put behind bars. "Too many violent criminals are getting community sentences because judges are aware that prisons are overcrowded. "People who should be locked up are not being locked up." If this policy was too make room for murderers and rapists to spend more time behind bars then it was to be welcomed, she added. A Home Office spokesman said: "Custody will remain appropriate for women who are serious or persistent offenders. "However, the government is keen to encourage greater use of community alternatives for women wherever possible."